"K-W-L charts are graphic organizers that help students organize information before, during and after a unit or a lesson. They can be used to engage students in a new topic, activate prior knowledge, share unit objectives, and monitor learning"​ (K-W-L Charts - Assessing What We Know/What We Still Want to Learn, 2015). LINK TO VIDEO ABOUT WHY K-W-L WORKS FOR ELLS. This video discusses why the K-W-L strategy is useful for ELLs. It states that many ﻿teachers ﻿are already using it, but there are a few additional steps or teaching tips this lady provides that will help increase the effectiveness of this strategy for ELLs. Model with students first time using (scaffolding). Allow to draw pictures if they do not know the word. This is a quick 30 second video about how this strategy foster the love of reading for students as well as how it can be used for individuaul students, such as out ELLs who might struggle to comprehend, as well as for a whole group. Definition/﻿Description: K-W-L is known as an instructional reading strategy and is often used to guide students through a topic through the use of a graphic organizer or three columns. It was created by Donna Ogle in 1986. Students begin by brainstorming everything they know about a given topic, which recorded under the K column. Students then generate a list of questions or concerns about what they want to know about the topic,which is recorded under the W column. During or after reading, instruction, or lesson students answer the questions that are in the W column. This new information that they learn is recorded in the L column. The picture to the left is an example of a non-fiction story that students are reading and what they know before, want to know, and learned (KWL Reading strategy, 2015). This picture demonstrate hot this strategy can be effective in building prior knowledge as well as background knowledge which according to the SIOP model is critical in student literacy development (Echevarría,Vogt, and Short, 2013). Justification: For English Language Learners using this strategy will help identify what students know and what connections they can make prior to the lesson so the teacher can then modify their lesson to fit the needs of those students. Also this helps the teacher notice what students what to learn or still need practice on. According to Miller and Veatch, help students gain a better understanding of the reading/topic, because they are thinking before and decide what they want to learn and it allows them to be activate participants in their learning. Also these authors share ideas about how to differentiate this topic to fit other content areas and how the KWL can be modified, such as the K-W-L-S, where the S stands for still want to lean (Miller and Veatch, 2011). Some of the examples are listed below in the lesson segment. Also, according to our textbook, including techniques that make students learn visually and that elicit background knowledge before helps to "build repertoire of background experiences from which to draw on"(Echevarría,Vogt, and Short, 2013). Also using what students already know helps to build a strong foundation for building on new content, because of those connection before or prior to the lesson. Use for a problem and steps to do problem, example have them write down what they know about multiplying three digit numbers. Use about new unit, standard, or objective. Example, what they know about geometry. Use for story and use standards. Example, students are learning about how to identify the main points in a story. They can right down what they know about the story as well as what they know about how to identify main points. Use for writing. 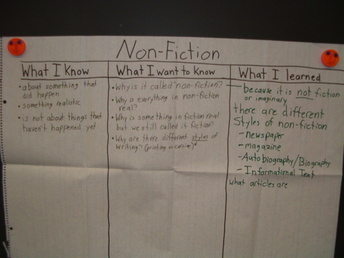 Example, what do students know about the writing process. Example- what do you know about global warming? What do you know about the animal? Use to study for an Exam. Use KWL chart to study for an exam. 1. The KWL chart has to start the unit. False- The KWL chart can be used at any point throughout a unit. Often times it is used to determine what concepts student have grasped and what the teacher still needs to teach! The K-W-L strategy is often used for differentiation. "Use diagnostic assessments to determine student readiness. These assessments can be formal or informal. Teachers can give pre-tests, question students about their background knowledge, or use KWL charts (charts that ask students to identify what they already Know, what they Want to know, and what they have Learned about a topic)" (Reading Rocketrs, 2015). ​The picture below is one way to use a KWL chart in a different subject besides just reading. This example shows basic information students know and what they want to know as well as what they learned. This example would be different for every students, but that is why this strategy is good for ELLs. They might not have the same language understanding about season as someone that has lived in the country their whole life. For example where they were born maybe there was no winter so they only thought there was one season or three seasons. This demonstrates how everyone knows something different but hopefully by the end they all have learned they same thing! (KWL Reading Strategy, 2015). Miller, M., & Veatch, N. (2011). Literacy in Context (LinC): Choosing Instructional Strategies to Teach Reading in Content Areas for Students Grades 5-12. Pearson.